After the first leg, from Fontainebleau to Alès, the 2016 Monte Carlo eRally changed pace yesterday afternoon, to put the priority on regularity. New Renault ZOE with the ZE 40 battery put in a flawless performance here, though things would get somewhat more complicated a little later on. From Alès Town Hall, a neutral track took us to the Alès Motorsport Complex, where our first trial would involve running two laps round the asphalt rally track at an average speed of 36.1 km/h. That sounds pretty straightforward until you realize that at least one of the laps would have to be completed in 3’01”. We were one of only six of the 34 runners to manage a flawless score here. And our team of bloggers (Alexandre Stricher from AUTOcult.fr and Michael Torregrossa from Automobile-Propre.fr) achieved two successive laps within single-second precision, a feat accomplished by only one other runner. After these very satisfying results, we’d be heading for Nîmes for the next leg of the event. Everything went just fine through the first regularity section. From Fontvieille to Eyguières, road conditions raised no major difficulty for sticking to 46.6 km/h, despite significant traffic up to 20:00. 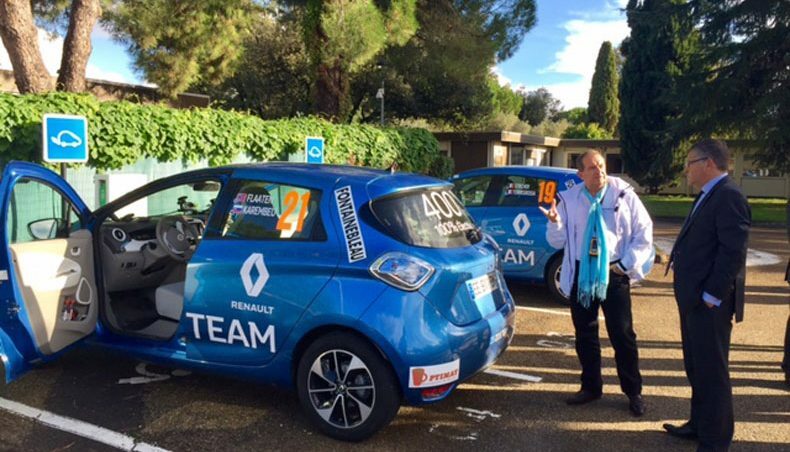 After what we thought had been a good performance over the twenty kilometres of the trial, we headed for the Renault Manosque dealership. With a route taking us to Monaco for around 04:30, each the Renault ZOE would have to count on having enough power on board so that the teams could concentrate on the road alone. Admiring guests were flocking around the ZOEs when the first results came in. The picture was nowhere near as bright as we’d thought. Last year’s winners, Pascal and Aurore Ferry, were ninth, with six points. Greg and Yves Munier came in 15th (8 points) and we finished 19th (12 points). The leader had just a single penalty point. But Gro Flaaten and Adriana Karembeu had lost a lot of points owing to over-high speeds though the first section. As the minutes ticked away, the picture became clearer, if no less disappointing. We held an impromptu meeting to examine why our highly favourable in-car impressions were belied by the official results. Why weren’t we as close as we’d imagined? Why weren’t we higher up the ranking? For all our cars we found a time-lag that grew with the mileage. Though our pacing looked perfect from the ZOE instrument panels, we were behind on the times set by the rally officials. We’d need a way to line up the 46.6 km/h as seen from inside our Renault ZOEs against the official 46.6 km/h in the roadbook schedule. Each team would have its own strategy for handling this. 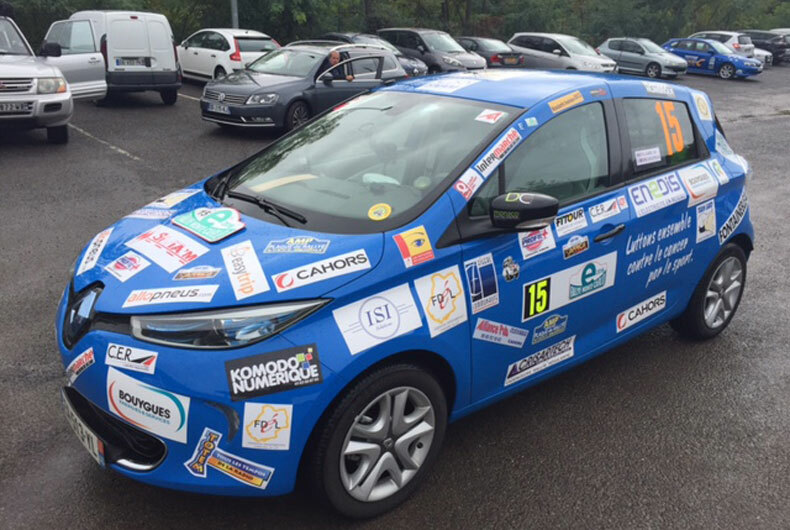 In Renault ZOE n°19, we decided to shave around a second off the timing every five kilometres. This would mean a roadbook offset of about forty metres at the end of the second regularity section, hoping that this would be enough to compensate for the difference between actual and perceived pacing. The second section was frankly a mess! As well as being stressed out by the new calculations, I was completely thrown by two village crossings in particular: the 30 km/h speed limits put me way out of the required averages. It would be really hard to resync at 48.8 km/h with metronomic rigour. It’s tough to see the metres slipping away and realize you won’t be able to make the time up until you pass the village exit sign. To make matters worse, regulations impose a heavy penalty for exceeding the set average by more than 20%. So when you lose 50 metres at 30 km/h in a village, it takes you a good kilometre before you get back to the right pacing. Though we’re not quite sure on this, it looks like the scoring locations are set by the rally organization committee and unknown to the runners. Here’s hoping they’re far enough from these villages to minimize our inaccuracies there. It’s worth noting that compliance with speed limits is monitored by a Tripy unit, which sends the data to the rally organization in realtime. Any excess carries a prohibitive 1,800-point penalty. After a short break, we were off for the last regularity section in Aups. This time, the crossing went without a hitch. Though we were not entirely penalty-free, our strategy seemed to be working fine. So let’s just hope our calculations were close enough. We won’t know until all the contestants have completed this section.